The results of the InsideIIM Recruitment Survey 2014 are out. The survey was carried out over the month of August 2014 and was concluded on 31st August 2014. The results are based on around 900 clean responses after weeding out fake and inconsistent responses. We will be sharing important and relevant slices of the results in the public domain. Over the past two years, the InsideIIM Recruitment Survey has established itself as one of the most credible sources of insight on companies, job profiles and aspirations among the B school community. Our survey is closely tracked by recruiters and used by them to define their compensation plans. We will be sending the results of our survey to a list of 100 leading recruiters in India. B school students, aspirants and alumni are also advised to carefully study the results of this survey before taking any career decisions. 1) MBA aspirants and first year MBA students: With the academic year having just started, we expect first year students to have obtained very little exposure at the time of taking the survey and they have been clubbed with MBA aspirants as one group. 2) Class of 2014 – 2nd year MBA students: Having spent more than a year in B school and having done a summer internship, they are likely to have a different perspective. 3) Post MBA industry professionals: The world changes completely once you begin to work after graduating from B school, and Post MBA industry professionals are likely to have a totally different perspective to the two earlier groups. This question was posed only to MBA aspirants and first year students. When asked what the most important placement-related criterion while joining a B school was, an overwhelming four-fifths of respondents replied that it was the quality of the job profiles offered at the B school. In contrast, only 14% were concerned about having 100% placements by April. The results show very little deviation from the 2013 survey, and it is now amply clear that this generation of aspirants and B School students prioritizes job profiles and quality of work over job security. On our website, we have long argued that 100% placements is a pointless criterion to judge a B school. The B school is not obliged to provide a job to everyone, its primary task is to provide an education. 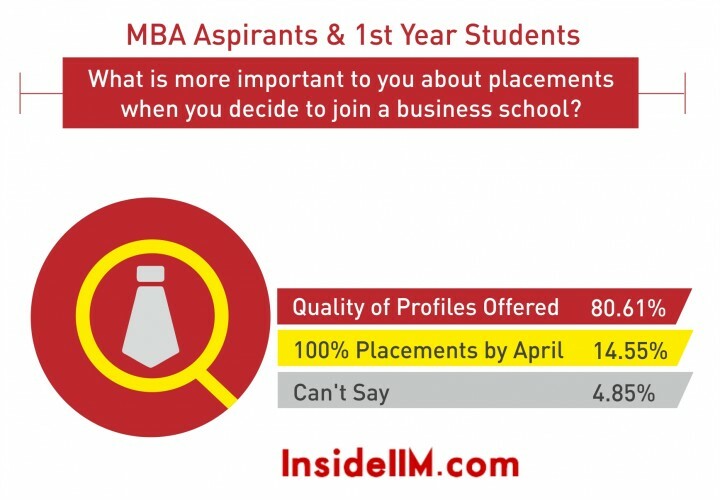 It is therefore heartening to know that students have begun focusing on the profiles offered at B school, and are accepting the uncertainty that is implied in the absence of 100% placements. 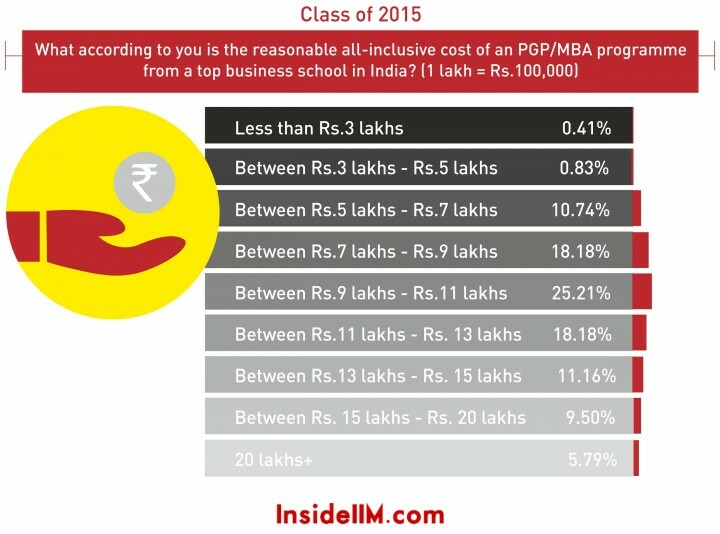 Estimated Reasonable Cost of an MBA programme – What according to you is the reasonable all-inclusive cost of an MBA program from a Top Business School in India? 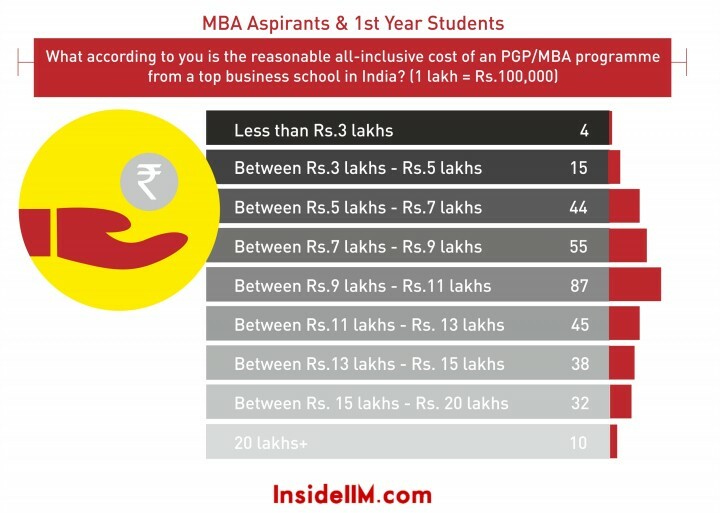 When asked what was the estimated reasonable cost of an MBA program, again the largest number of respondents (among aspirants and first year students) placed it in the Rs. 9-11 lakhs bucket. About 26% of the respondents in this bucket ascribed the reasonable cost of an MBA program to about Rs. 9-11 lakhs. This is higher than last year (23%), and lower than the year before. In short a comparison between last year’s distribution and this year’s distribution would reveal that MBA aspirants and first year students have started ascribing a lower value to the reasonable cost of an MBA program. Yet again, the largest number of respondents (among class of 2015) has placed the reasonable cost of an MBA program in the Rs. 9-11 lakhs bucket. The distribution of responses indicates very clearly that most 2nd MBA students ascribe the cost of an MBA program to Rs. 9-11 lakhs. There is an interesting trend here. In last year’s survey, we had seen that most alumni respondents attributed the value of an MBA to around Rs. 7—9 lakhs. That has changed this year. The majority of respondents this year have placed the reasonable cost of an MBA program at Rs. 9-11 lakh. A look at the distribution would reveal that it is balanced and not unduly skewed on either side. What could explain this increase? One possible explanation is that the alumni who took this survey did their MBA at a time of increasing fees. Their perception of the value of the program may be influenced by the fees they were charged for it. However, as we noted last year as well, we no longer seem to be in an era of increasing fees – the continuous increase in fees was no longer sustainable. 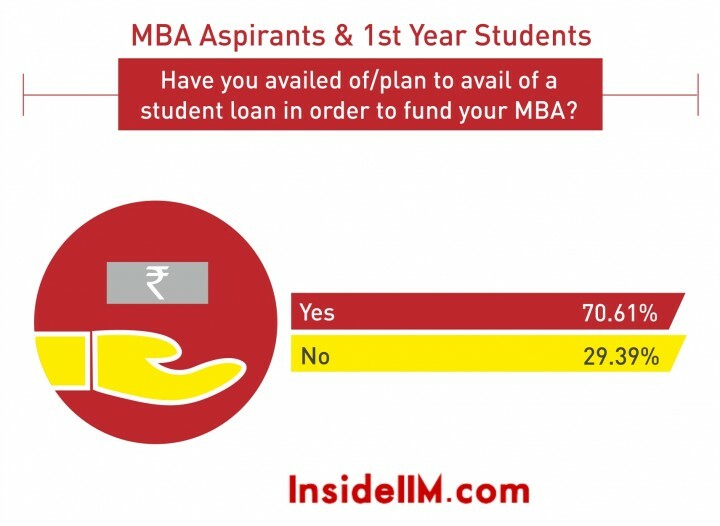 The percentage of loan takers among MBA aspirants and first year students is 70%. This figure was similar last year, but among the second year students, (based on last year’s data), the fraction of loan-takers is about 65%. An increase in the percentage of loan-takers does not bode well for entrepreneurship. Again, there is a clear thirsting for foreign locations, across all three categories of respondents. The results also reflect the reality of choices facing all three categories of respondents – it is less likely for a freshly graduated MBA to get a foreign posting directly, whereas senior professionals are more likely to have the flexibility to choose their place of work. Accordingly, the results are as below. Three Indian cities make it to the top five, compared to last year, where only two Indian cities made the top five. New York still remains seated on its perch at top spot, followed by Mumbai which displaces London from second spot to third. London is followed by Bangalore and Delhi. Delhi makes a re-entry into the top five after a one year gap; perhaps this is indicative of the growth fuelled by companies like Jabong, Zomato etc. Clearly, MBA aspirants and first year students seem focussed on job opportunities in the Indian space. Among the class of 2015, the top two are again foreign locations, like last year – New York and London. Mumbai retains third place, followed by Singapore and Bangalore. It appears that preferences haven’t changed drastically – except for London rising a couple of notches and Singapore falling a couple. The preference for Indian locations remains the same as last year. The preference for foreign locations is quite clear in this group, with New York, London and Singapore leading the list of global work locations. In case of post industry MBA professionals, we understand that many of them would have had the experience of working in different cities across the world. They would have now reached a position where they could exercise their options and earned the flexibility to work in a city of their choice. This list of preferences, is therefore indicative of the choice and not merely the dreams of post MBA industry professionals. 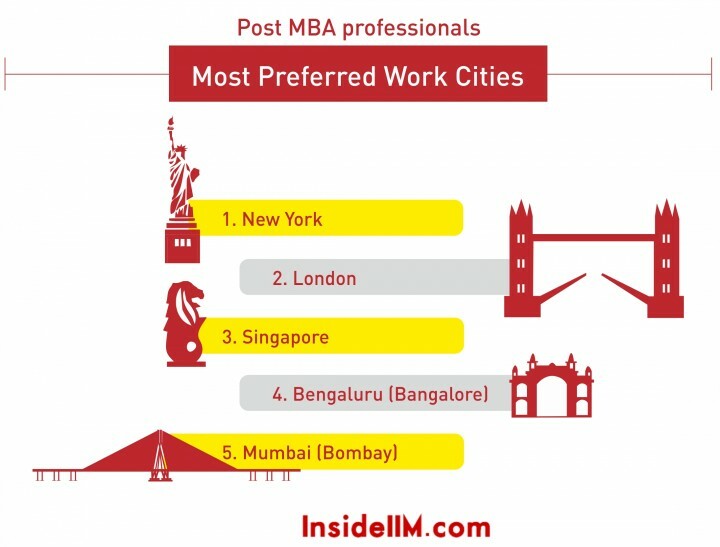 Last year’s survey had seen a similar preference for foreign locations among post MBA industry professionals. 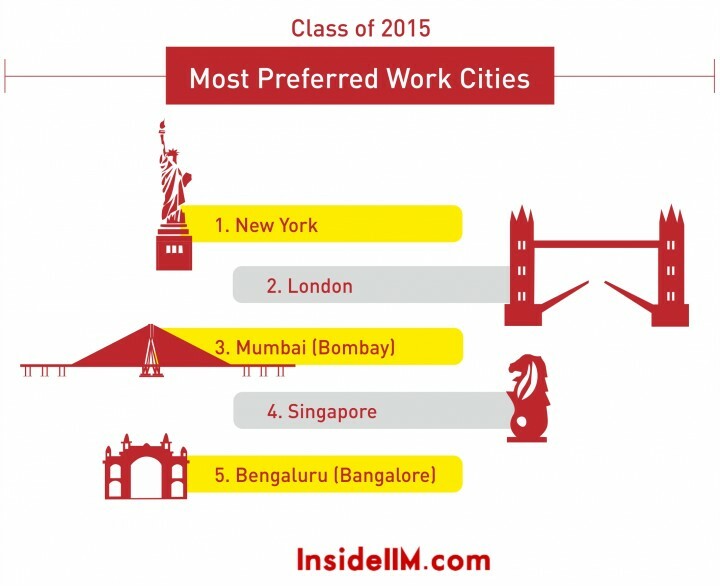 Among Indian cities, Bangalore, Mumbai and Delhi round out the top three. It is quite interesting to see Mumbai recede in preference as people grow older. Is it because they begin to realize that the quality of life here is not as great as it is made out to be? Is it because as you grow older, you start reflecting on your earlier career choices, and see your future in a different light, for example, prioritizing work-life balance over career growth? More such interesting slices of information will be revealed every day this week. 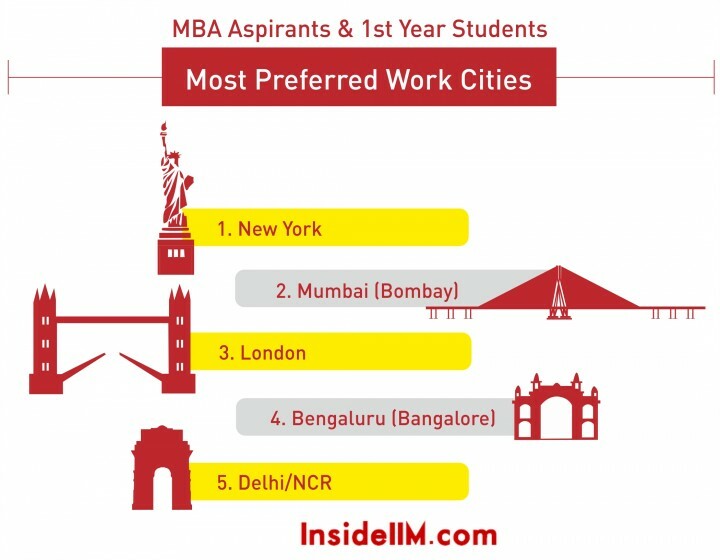 Part 1 – Most Preferred Work Cities, Loan Statistics, Cost of an MBA etc. Part 2 – Minimum Salary Expectations, Most Preferred Domains, Job Satisfaction and more. Part 3 – Most Desirable Banking and Finance Recruiters. Part 4 – Most Desirable Consulting and General Management Recruiters. Part 5 – Most Desirable Sales & Marketing and Technology Recruiters.